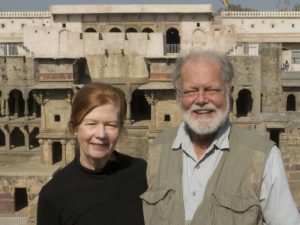 This is the final post by our client Keith Davey, about his experience of the birdlife of India while on our Mantra Big 5 Private Tour in February 2016. 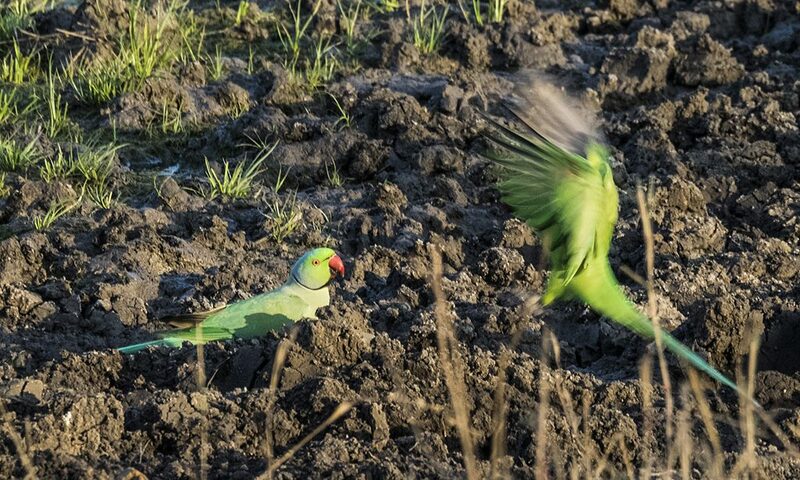 There are 1300+ species of birdlife in India. This compares with about 800+ species in both Australia and the United States of America. 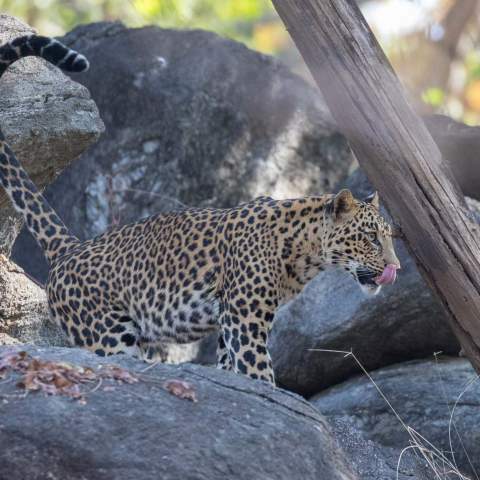 India is a bird-watchers paradise, and the best places to see them are in India’s magnificent national parks. 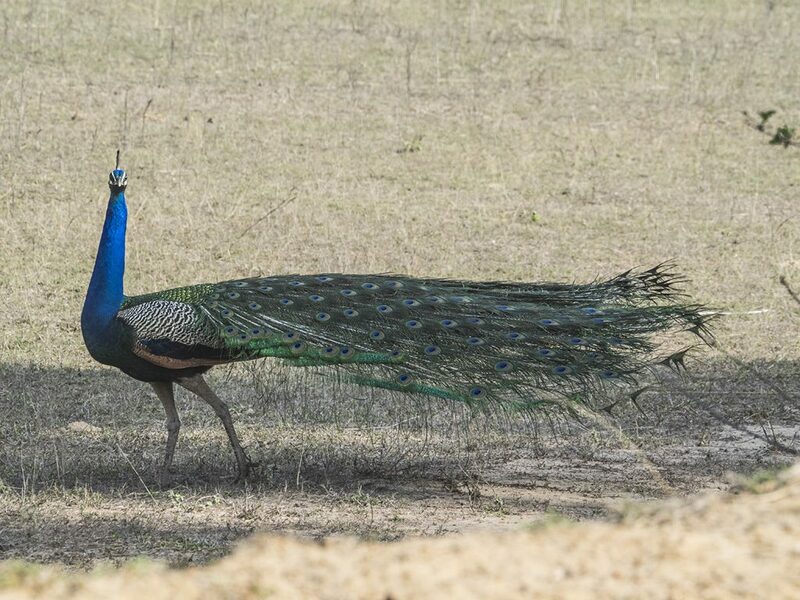 One of the best ways to observe and photograph the wonderful and colourful Indian birds is to go on one of the Mantra Wild Safari and Adventure Tours. 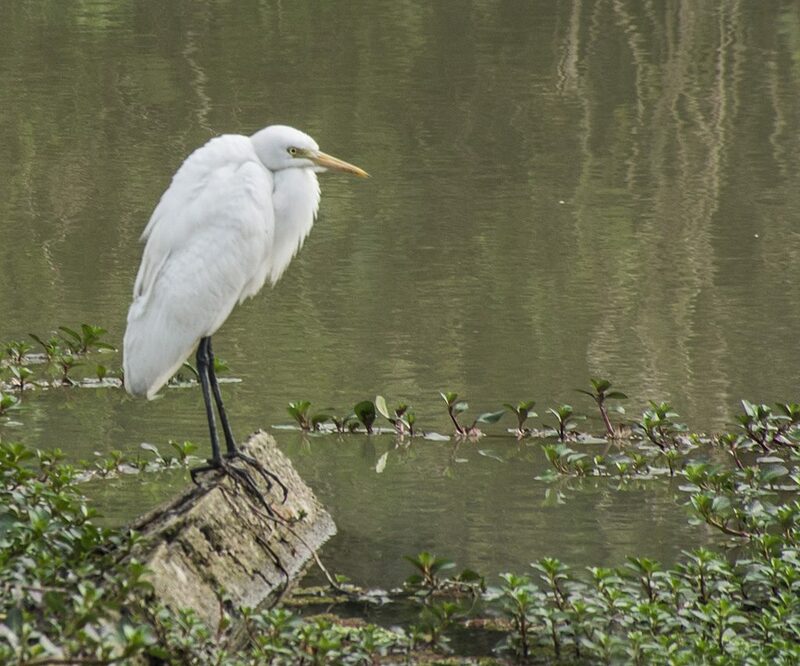 The easiest birds to observe are the water birds, since they congregate near lakes and rivers where they can feed on the abundant fish or other aquatic life. Because they are in open spaces they are more easily seen and photographed. Water birds are often larger than forest living birds, with the exception of the carnivorous hawks and eagles. 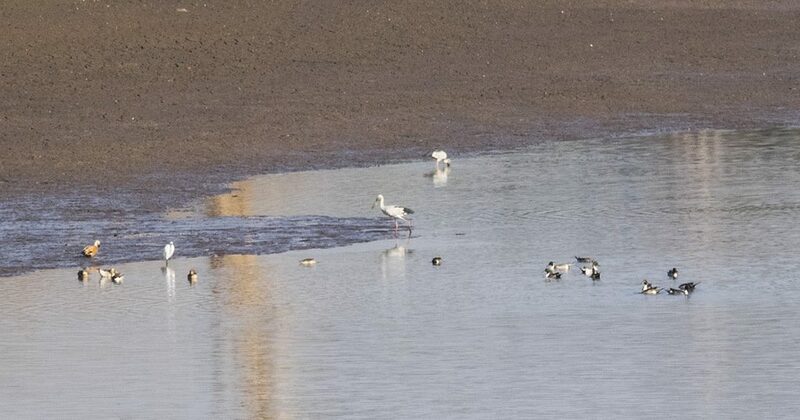 Our naturalist drivers were well aware that we would find water birds on almost every body of water we came across. There were only a couple of water locations where there were no birds at all. Most lakes, swamps and rivers have an abundance of water birds which kept Pat and I busy taking great photographs. 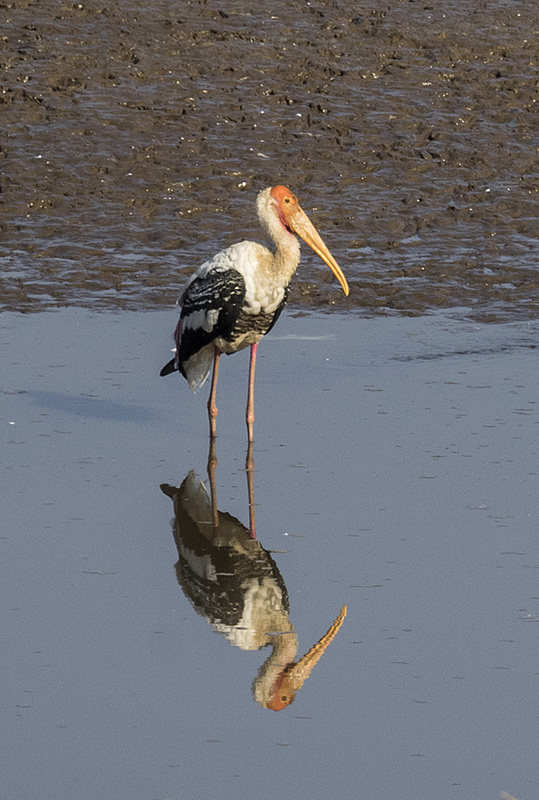 In India we saw geese, daters, egrets, cormorants, herons, kingfishers, lapwings, pelicans, ducks, storks and a variety of migratory waders. Some were similar to the types that we would find in Australia, others were very different. 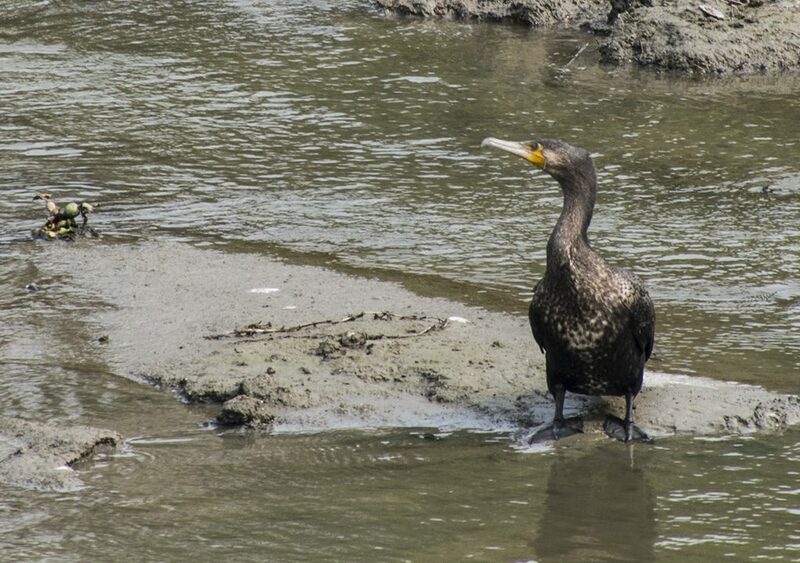 The Great Cormorant seemed familiar, as did the Oriental Darter and the Intermediate Egret. 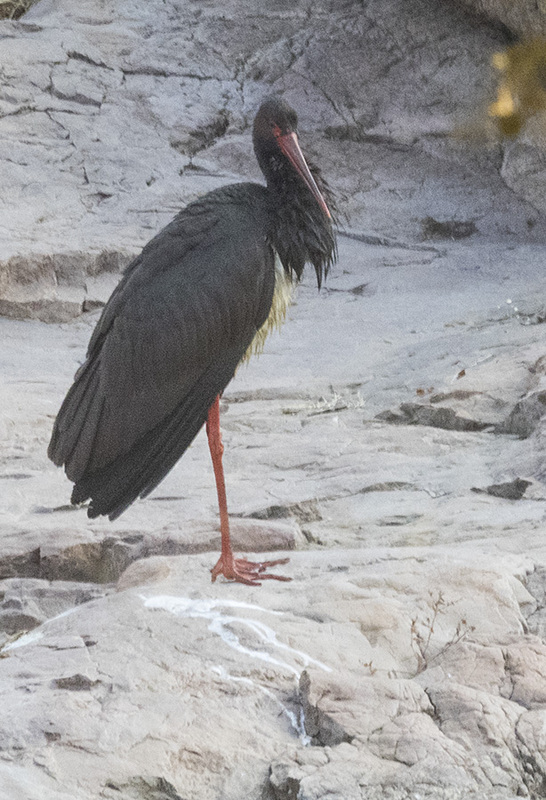 The two herons were similar to those found in Australia, with interesting differences. 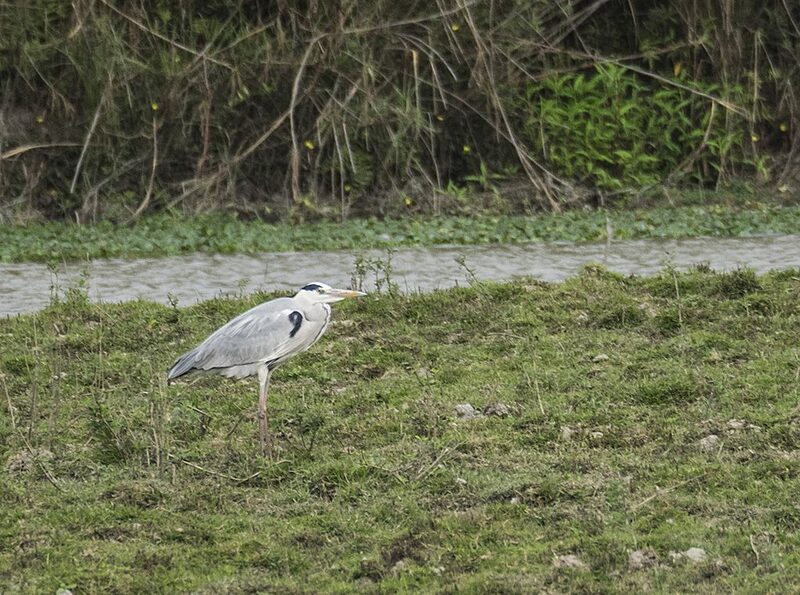 The Swamp Heron was like a tubby Hight Heron while the much larger Grey Heron is more stocky than our herons. 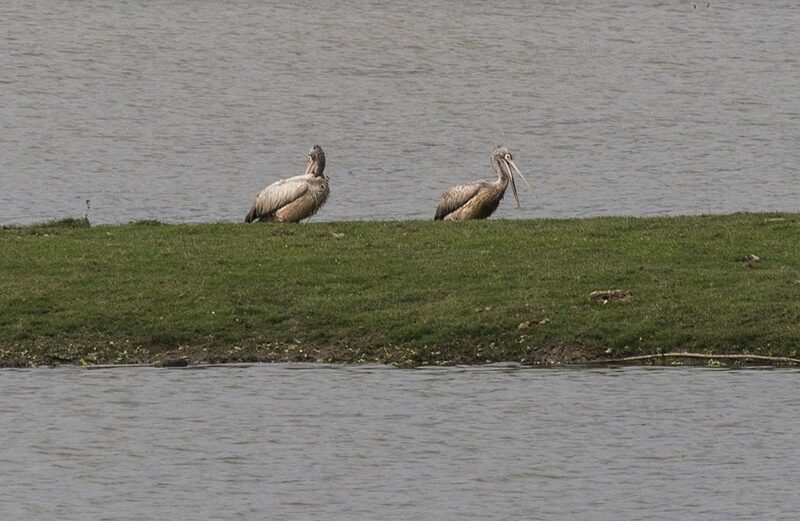 But the Spot-billed Pelican was a bit smaller and more marked. The Kingfishers are brilliantly coloured, swift fliers over water. 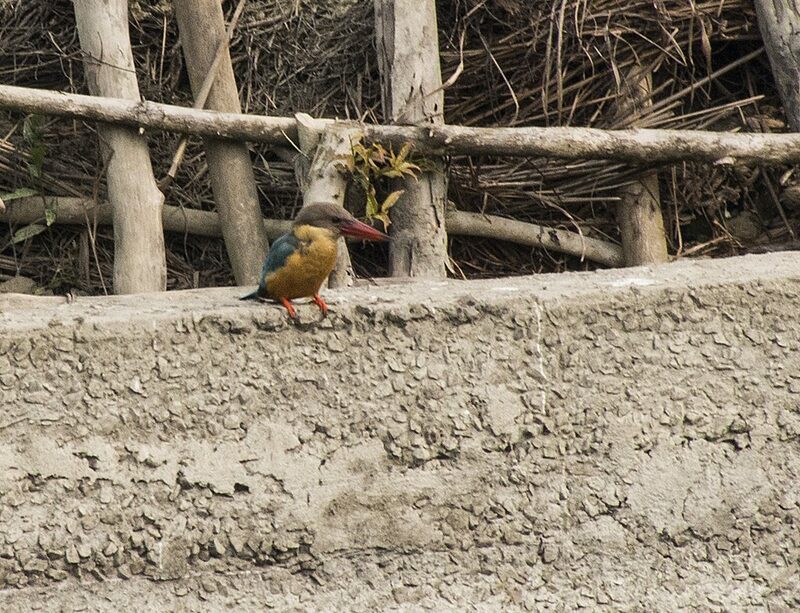 The White-breasted Kingfisher and Stork-billed Kingfisher are very attractive. 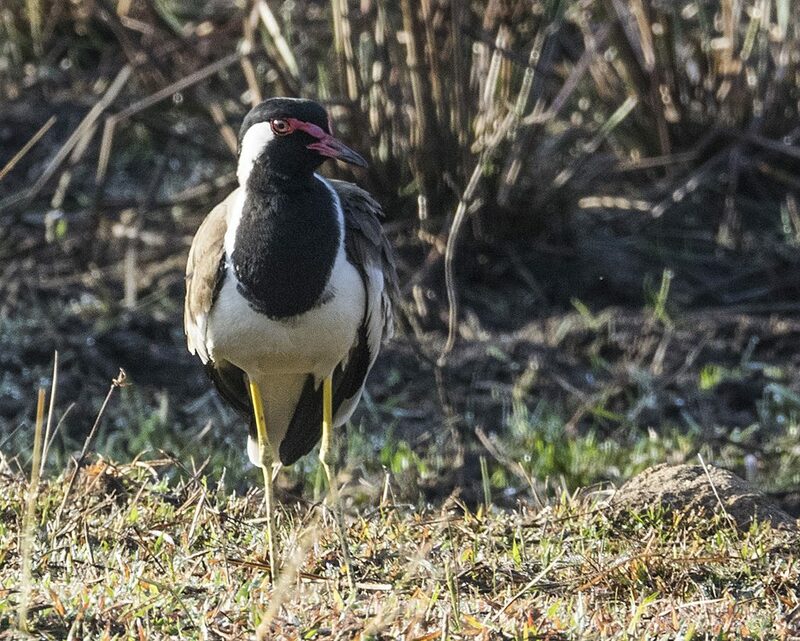 The cute Red-wattled Lapwing was seen in every national park where there was water and was also common on waterways at the small nearby towns. It soon became a firm favourite. 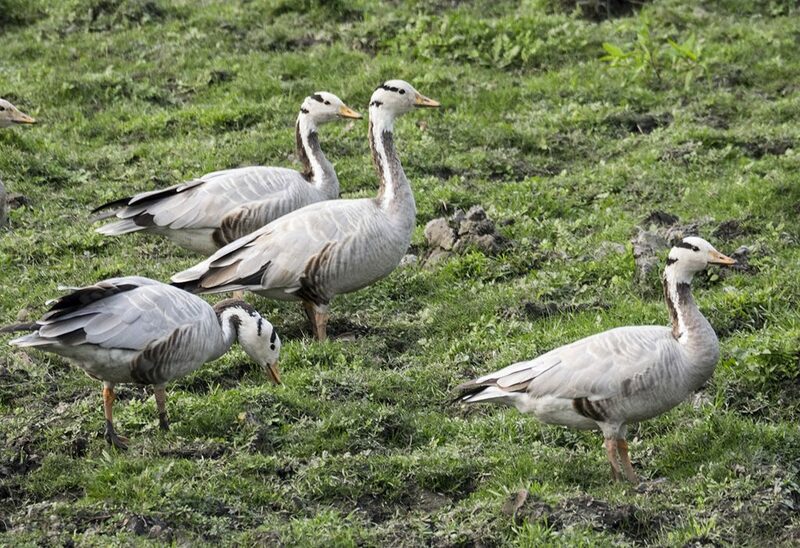 We only saw the spectacular Bar-headed Goose at Kaziranga national Park in north-east India, because there was so much water there in large swamps. 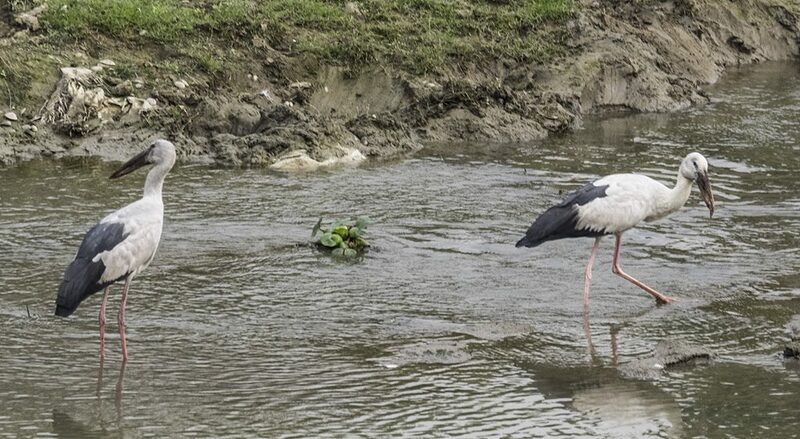 But the Indian water birds that intrigued us most were the storks. We photographed six varieties. 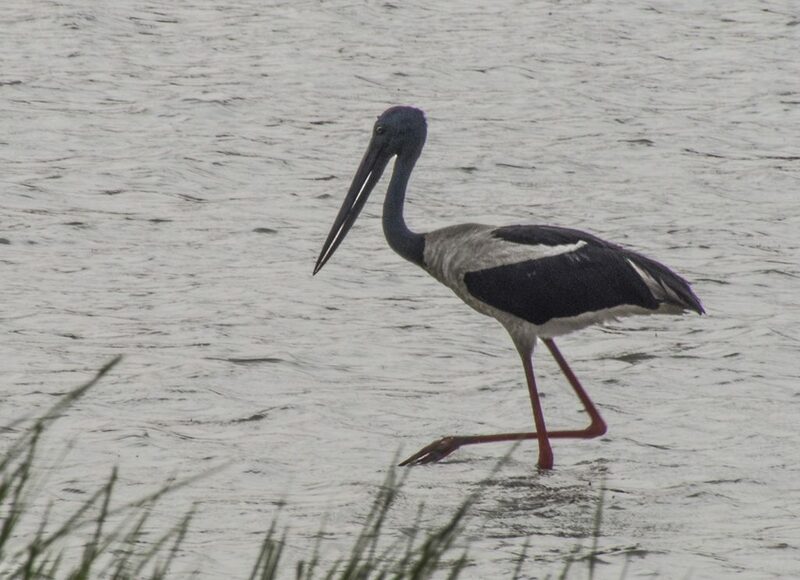 One was the the Black-necked Stork, that we in Australia call the Jabiru. But the other storks were new to us. They ranged from fully black to fully white in colour, with intergrades between. 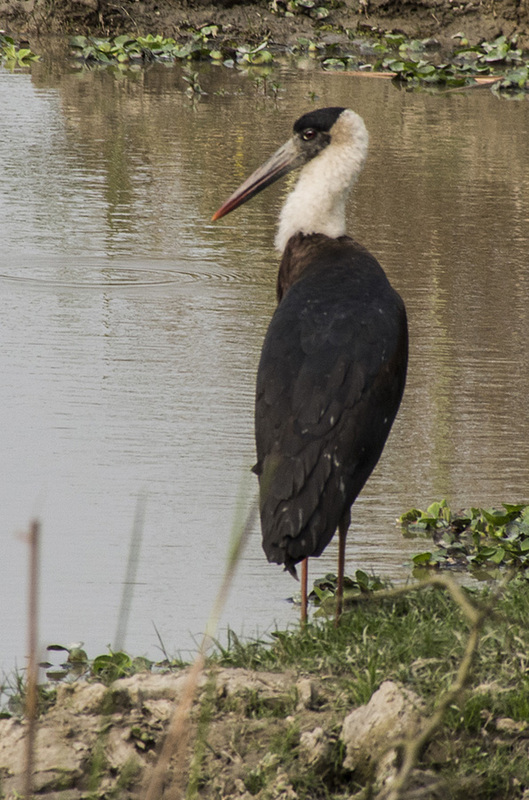 There was the Black Stork, the whitish Open-billed Indian Stork, the red-faced Painted Storks and the Wooly-necked Stork. 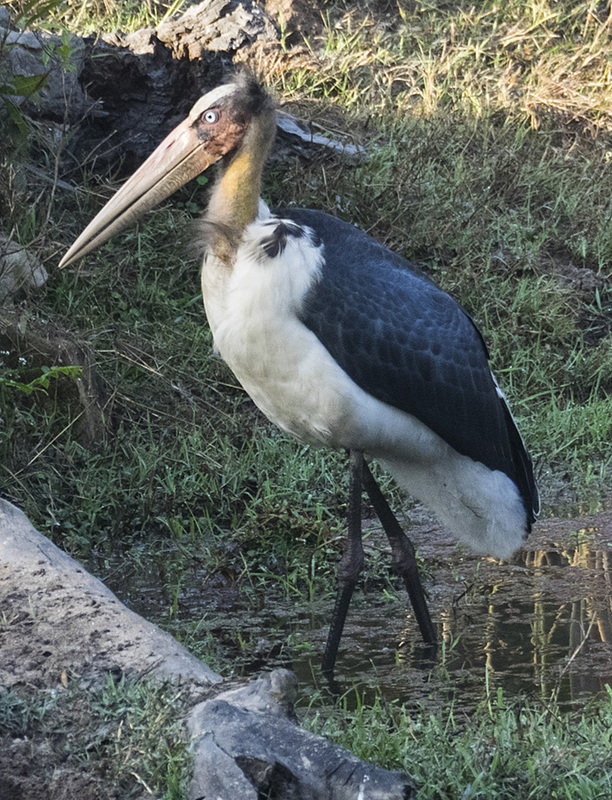 But the stork that appeared to be demented was the Lesser Adjutant. It was a big bird that seemed to have an evil glint in its eye as it searched for aquatic prey. The forest or jungle-living birds were no less interesting. 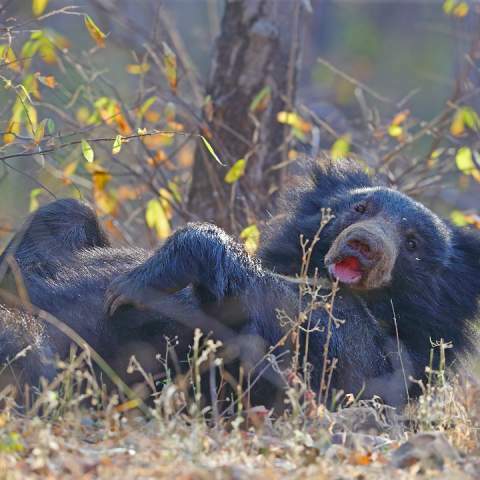 None of them seemed familiar to us and some of them may be endemic to India. The western and central national parks were all dry to moist deciduous forest where the trees had large leaves that fall during the summer. Some parks had numerous clumps of bamboo for the animals to hide. 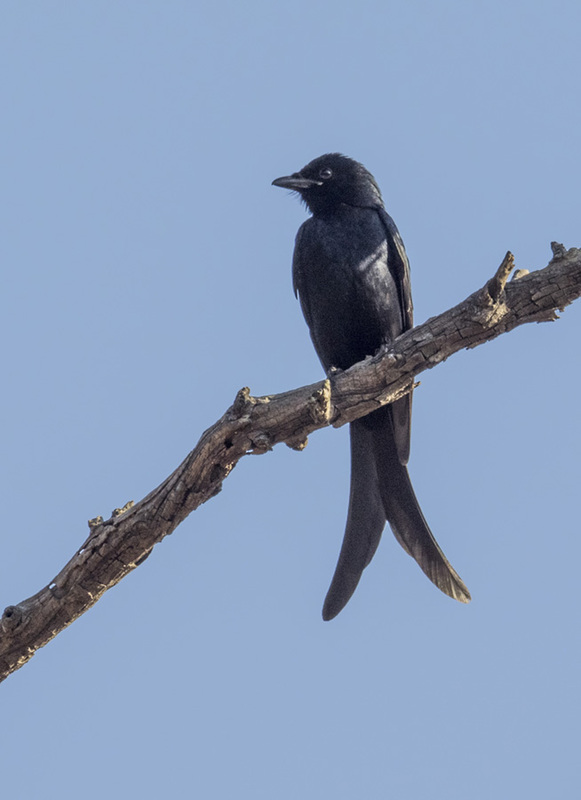 Most birds preferred to perch in mid- to reasonably large-sized trees. But the Junglefowls and Peafowl preferred the ground. 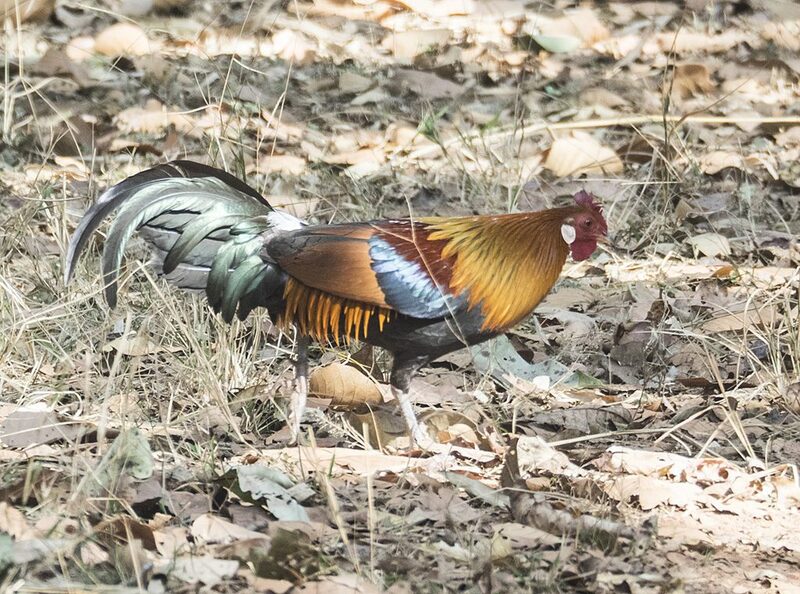 The Red Jungle Fowl was so similar to our domestic chickens, you could easily see where they were first domesticated. 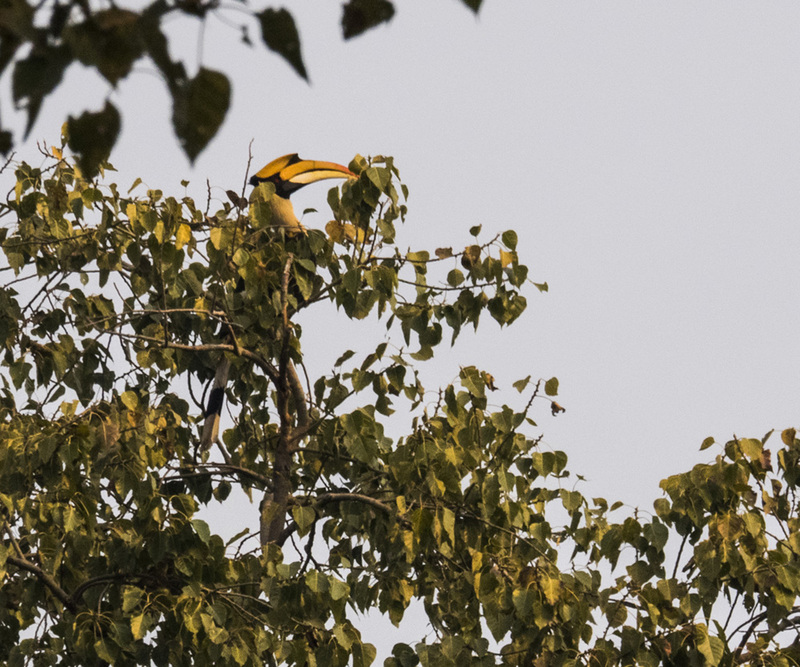 The largest aerial birds of the forest were the two hornbills. 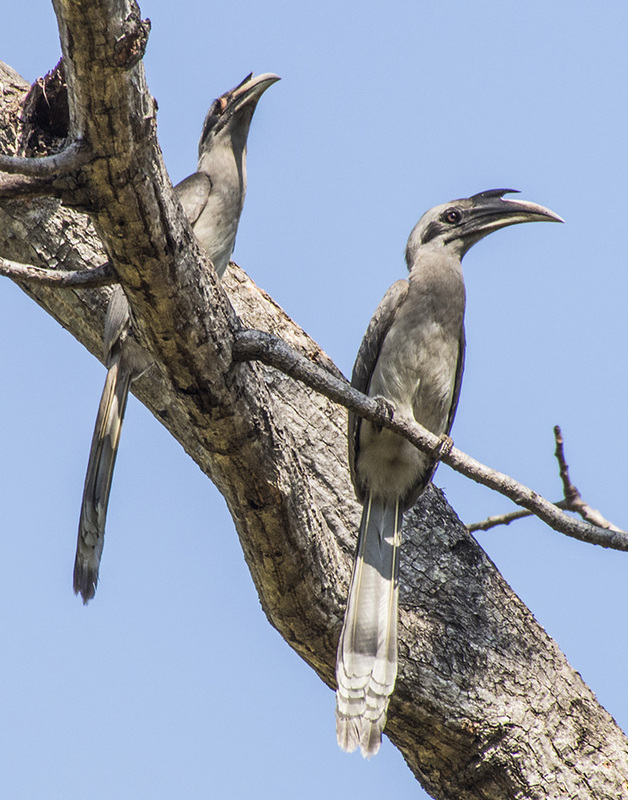 The most common was the Grey Hornbill. We also saw a few Great Hornbills, a most spectacular bird. 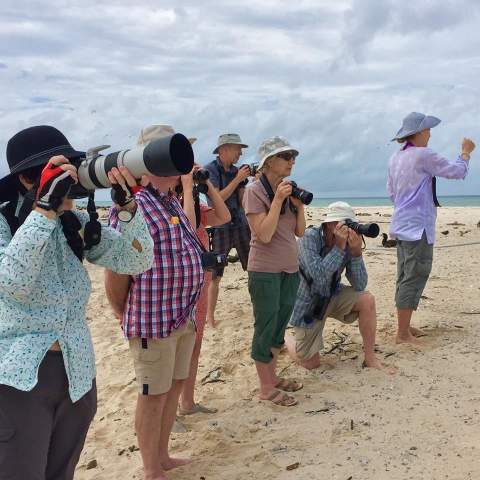 Two drongos caught our attention. 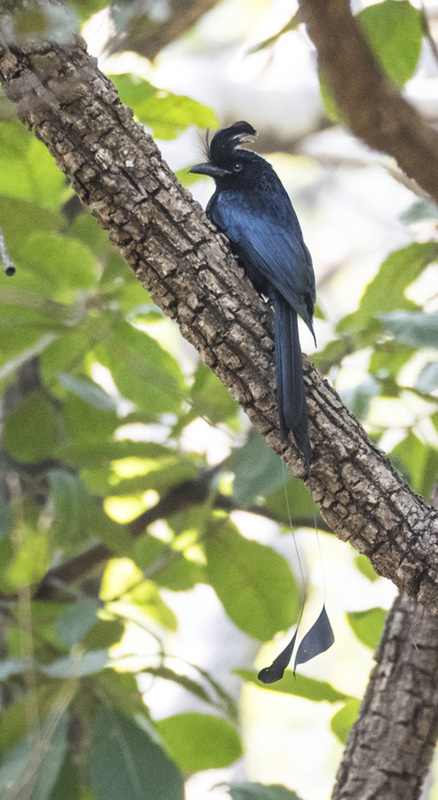 The more drab Black Drongo with its scissor-shaped tail and the very long tailed Greater Racket-tailed Drongo. There were two parrot-like birds. 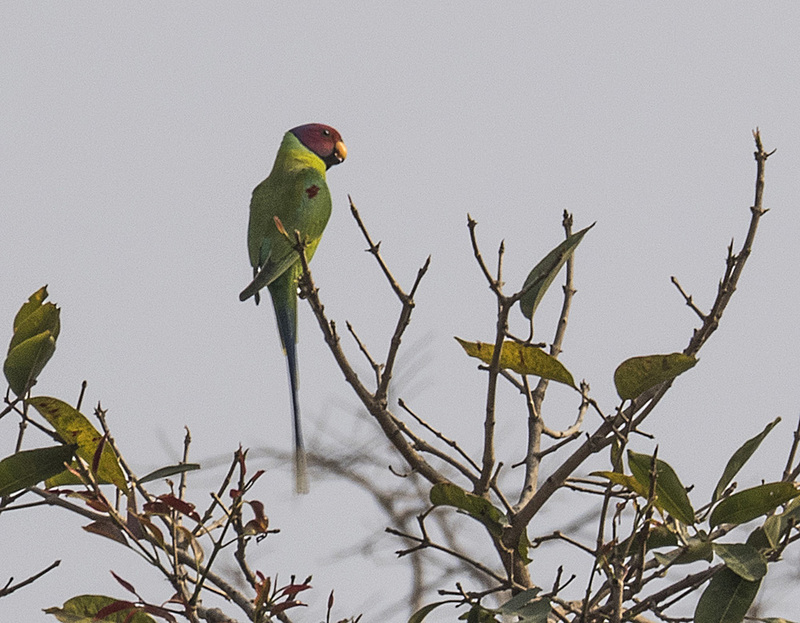 The most common is the Alexandrine Parakeet and the Plumb-headed Parrot, both which perched in the highest branches of tall forest trees. 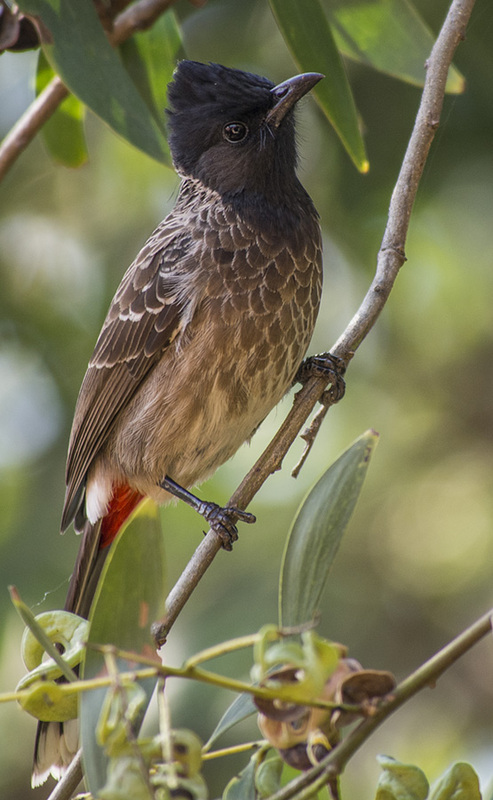 Then there were the numerous other birds, such as the red-vented Bulbul which was in every national park we visited, but was also common in the flowers of the wonderful lodges where we stayed. 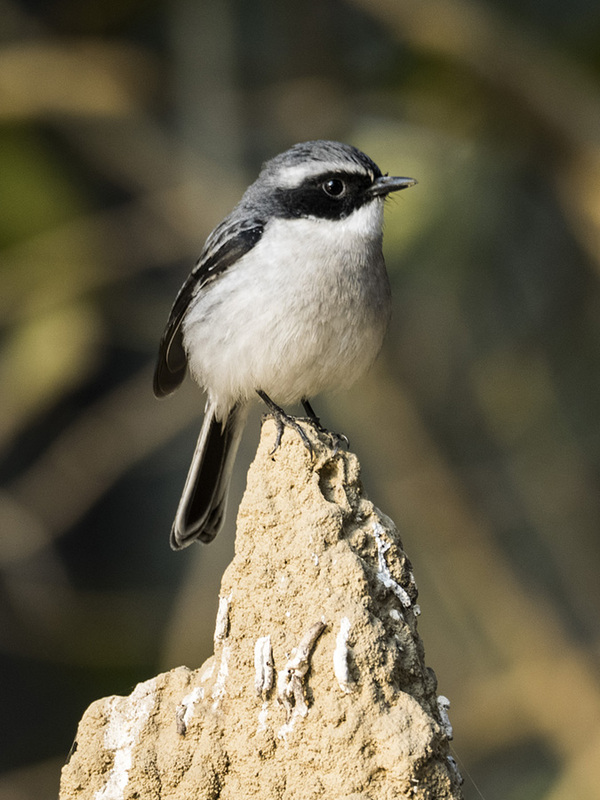 We photographed the cute little Bushchat in Corbett national park, sitting on a termite nest on our way to see the tiger and boar crossing the duty riverbed. 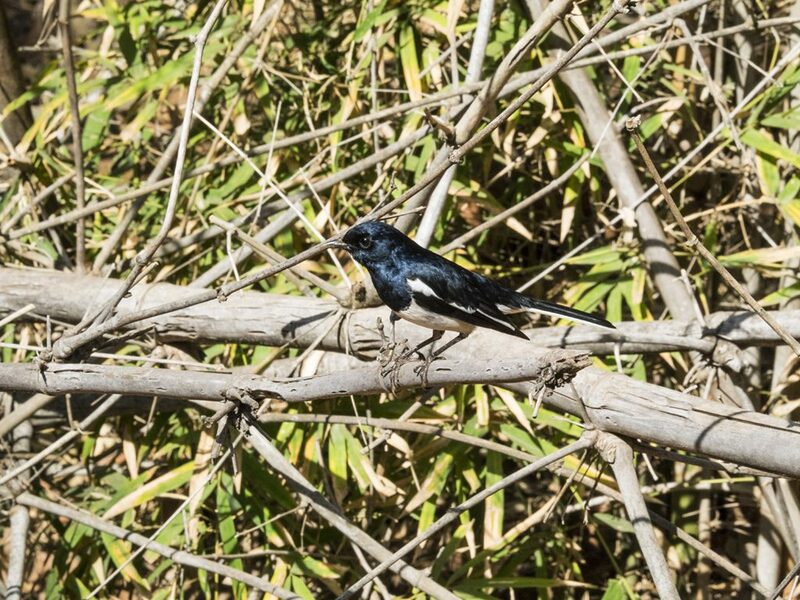 The iridescent Oriental Magpie Robin darted in and out of the bamboo. 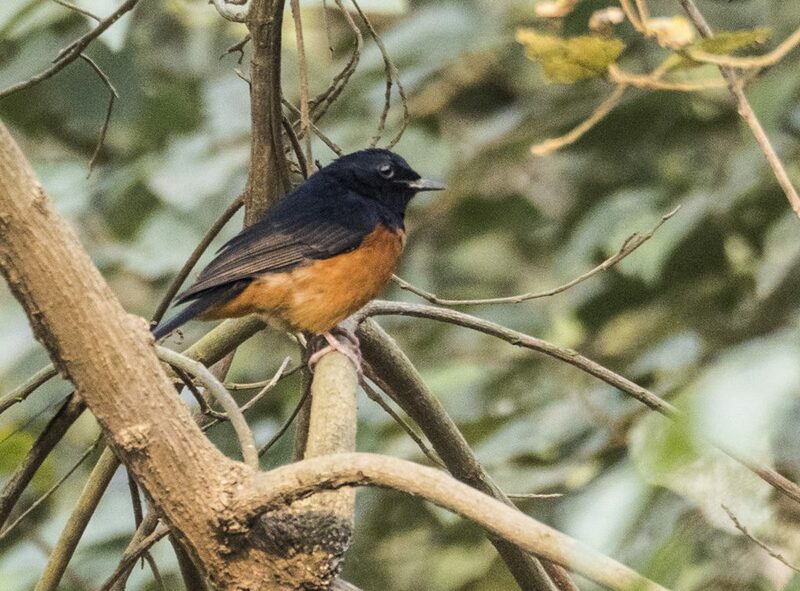 Or the Scarlet Minivet that preferred more dense vegetation in the trees. 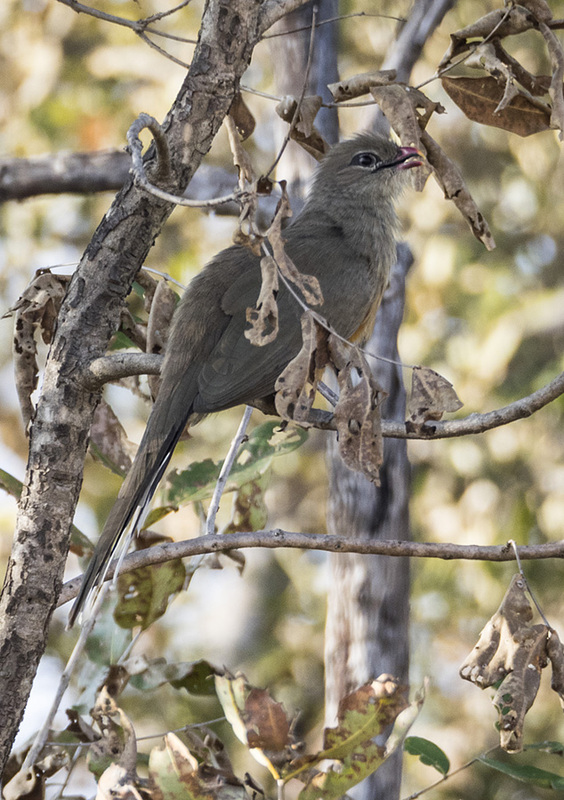 The most strange bird we saw was the Sirkeer Malkoha with its contorted posture while it was singing. 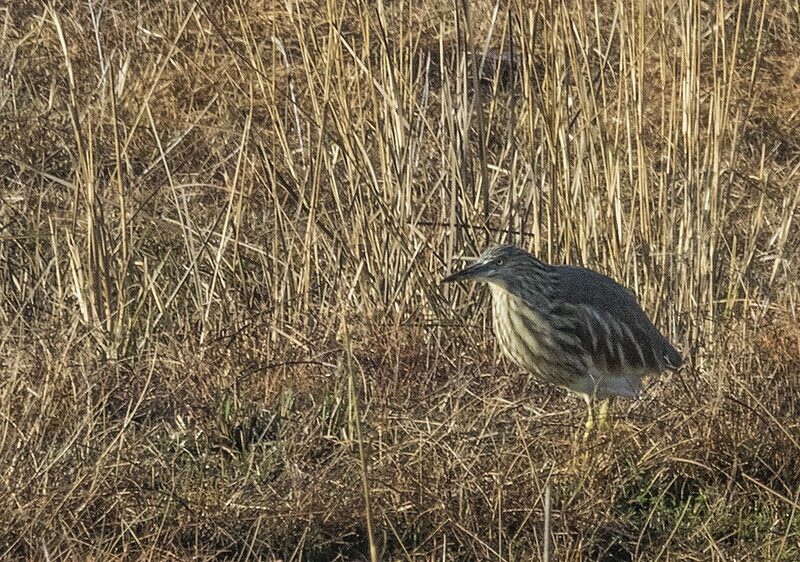 It is in the cuckoo family, but doesn’t lay it’s eggs in other birds nests. 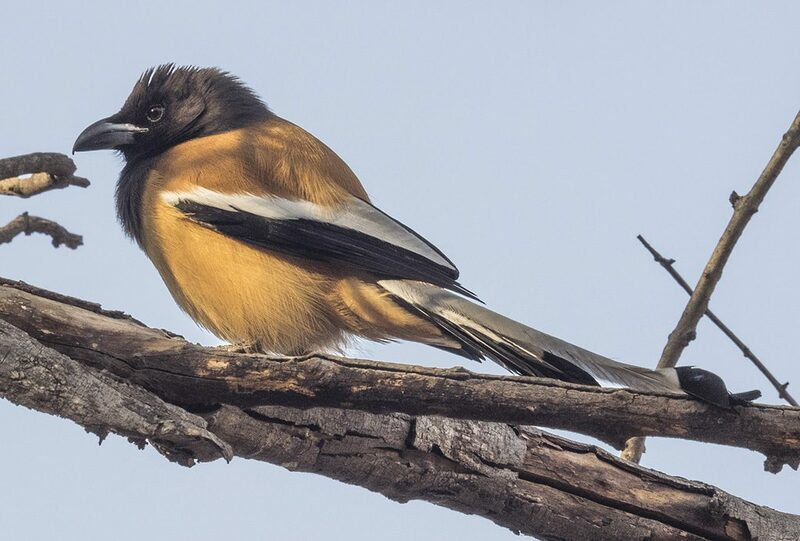 One common bird in the central Indian national parks was the Rufous Treepie. It is attracted to the places where humans were eating their lunches at remote ranger stations inside the national parks. 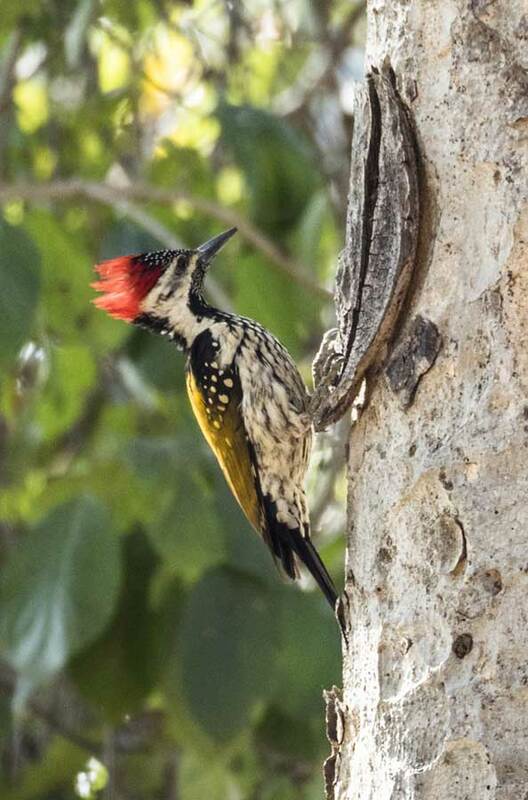 A loud knocking on tree wood attracted our eye to the Lesser Goldenback Woodpecker with its spectacular red hat. 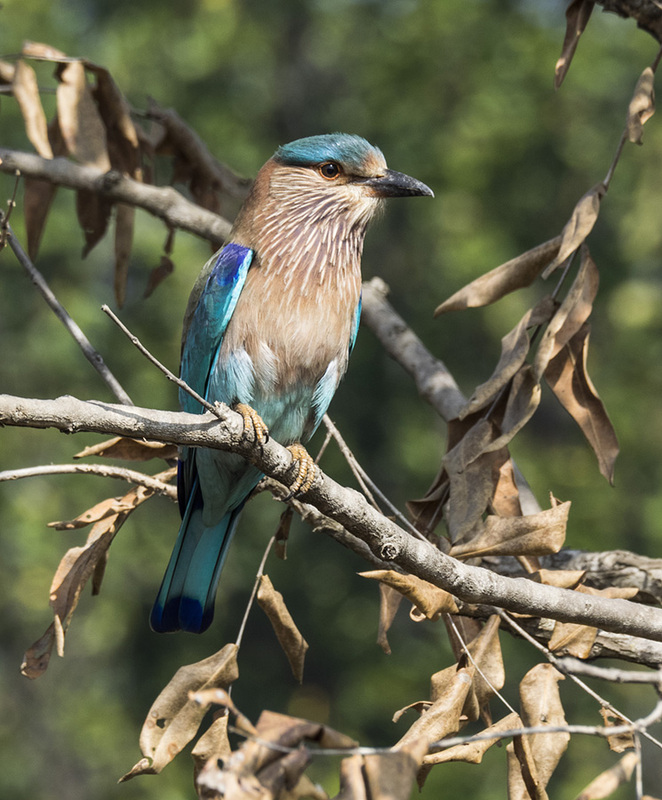 But the bird that both Pat and I feel in love with was the very pretty Indian Roller, a bird common to many national parks that we visited. The major group of birds that was most spectacular and impressive was the the carnivorous owls, hawks and eagles. 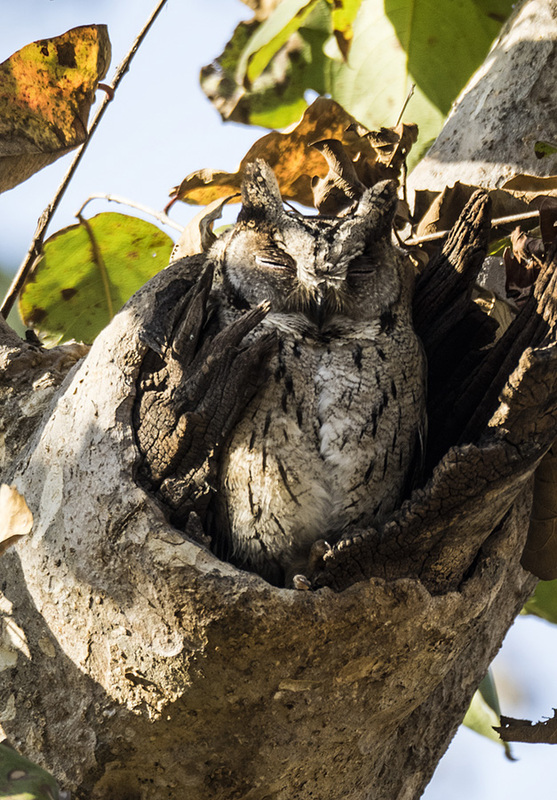 By far the cutest birds of the Indian jungle were the little and not so little owls. 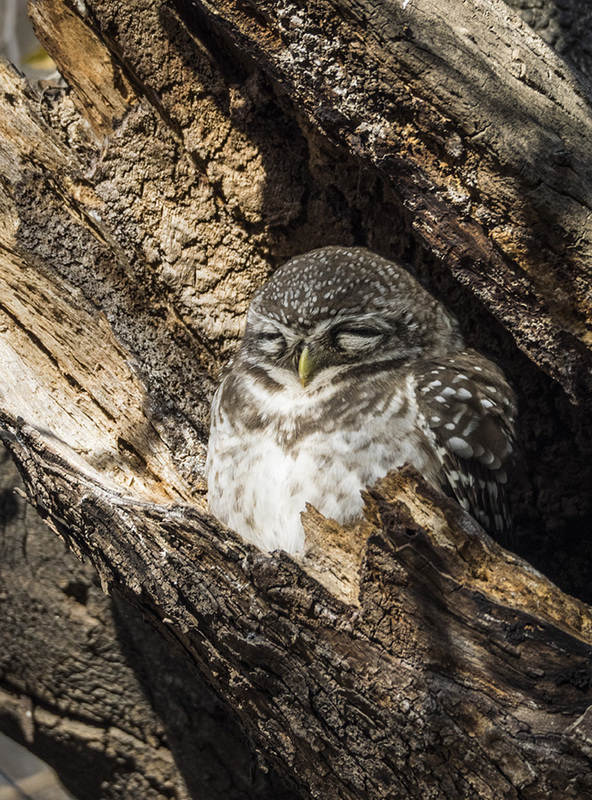 One particular favourite was the tiny Jungle Owlet, perched at the entrance to its nest in a broken-off tree limb. 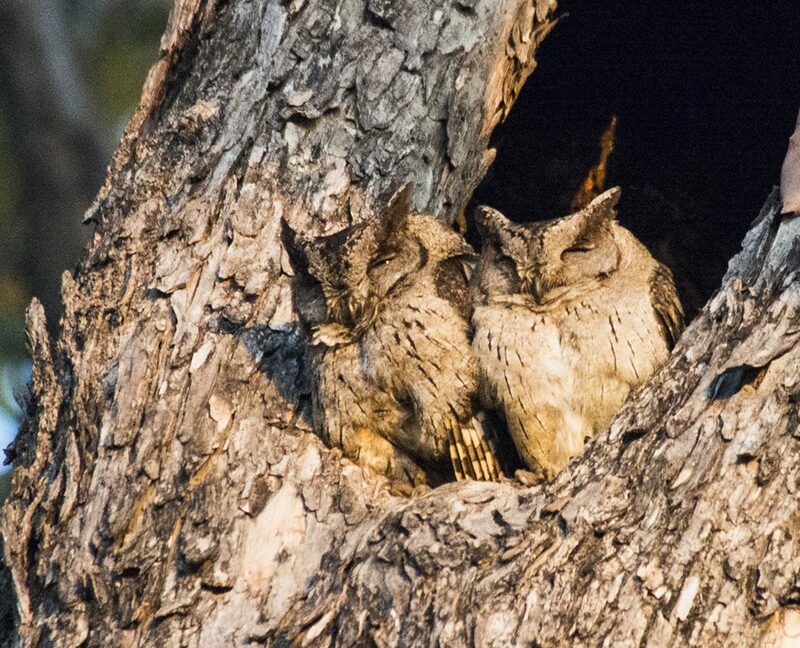 The other cute owl was the Scops Owls. This pair looked so cute together. Another cute owl was the Indian Eagle Owl. Their diet consists of rodents and small birds of the forest. 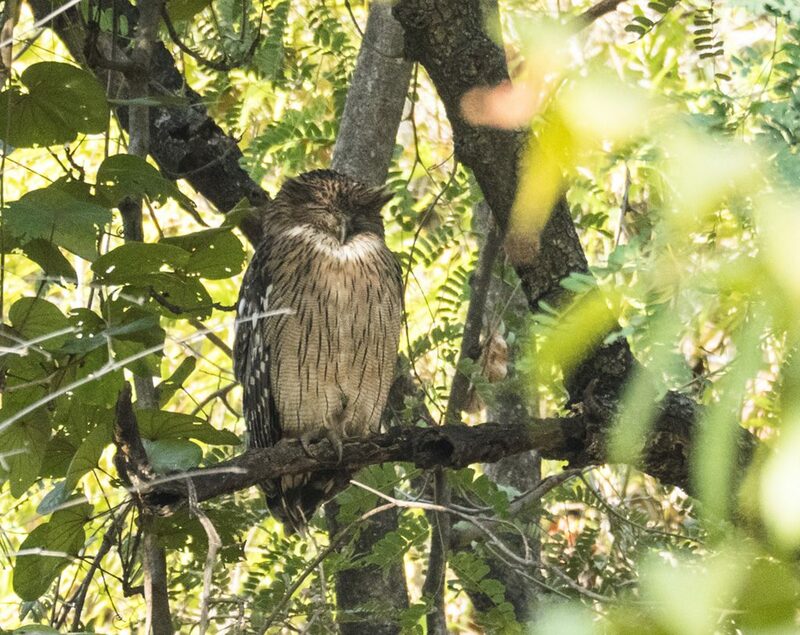 A larger owl was the Brown Fish Owl. Now we come to the eagles and buzzards. 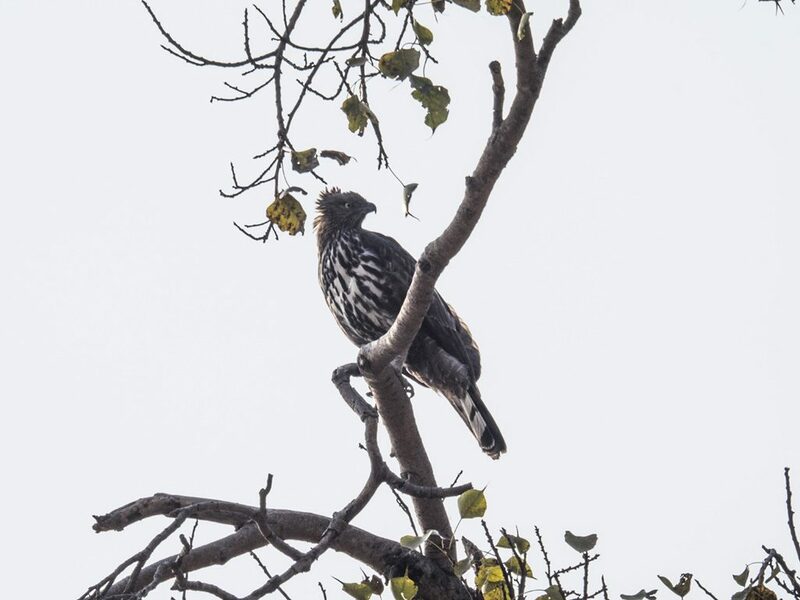 One noteworthy hawk is the Crested Eagle Hawk with its spectacular-looking head feathers. 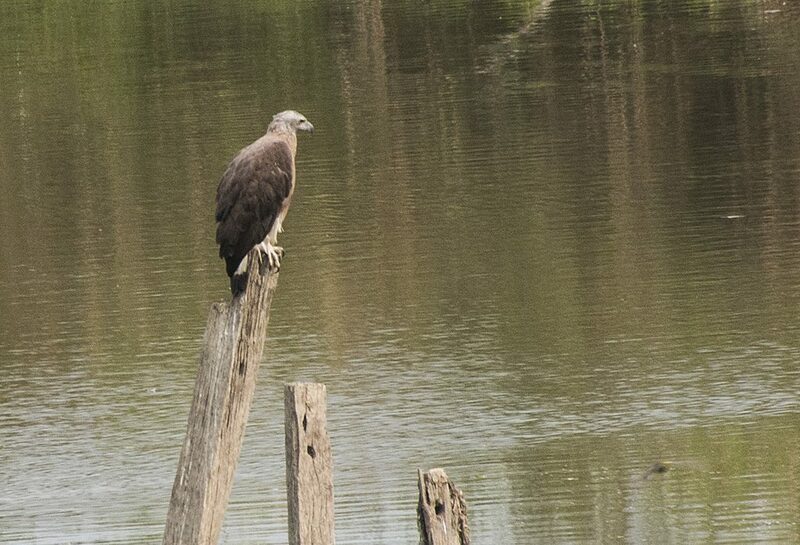 The most common eagle that we saw in a couple of national parks that had large bodies of water was the Grey-headed Fish Eagle. 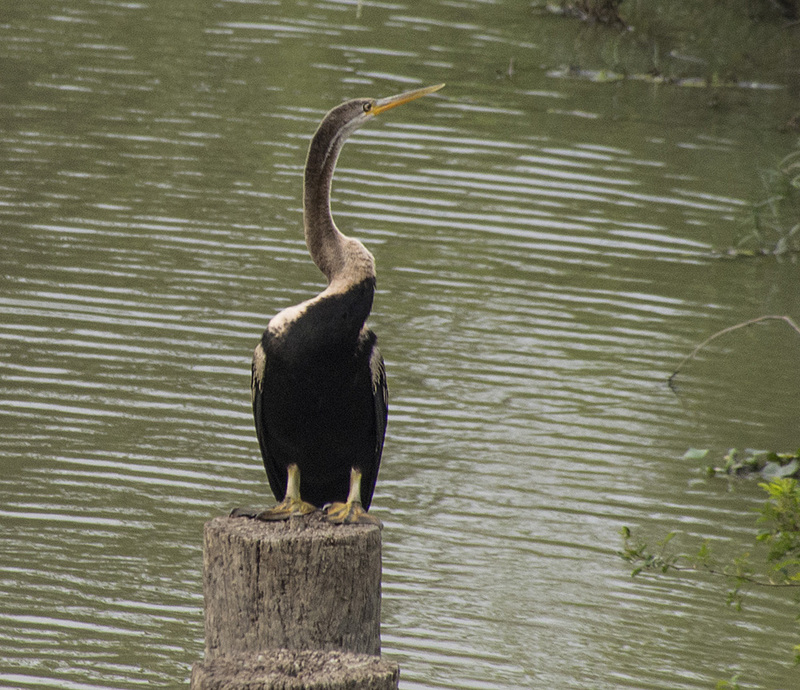 It most always sat on a perch, overhanging the water, scanning for prey. We were lucky to see a large juvenile sitting in its nest in a tall tree, looking out for its parents to return with fish food. We only had rare glimpses of the largest of the eagles. 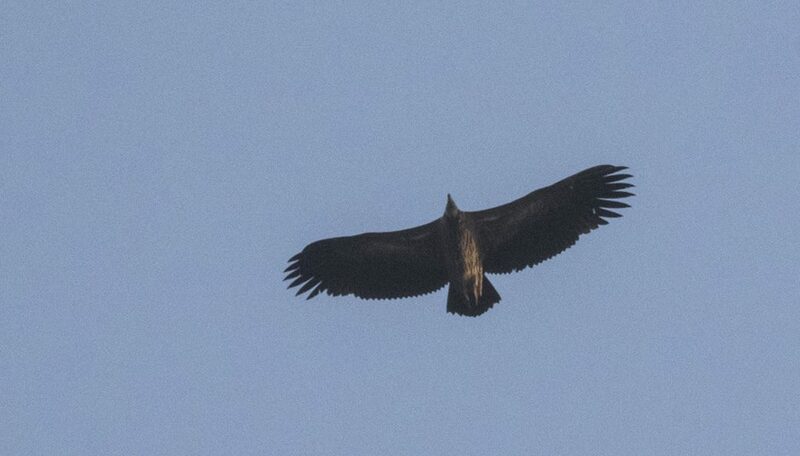 We were able to quickly photograph this Buzzard Eagle as it soared overhead. Photos like this quickly highlight the disadvantages of self-focusing cameras, which never quite make it before the impressive birds soar off. 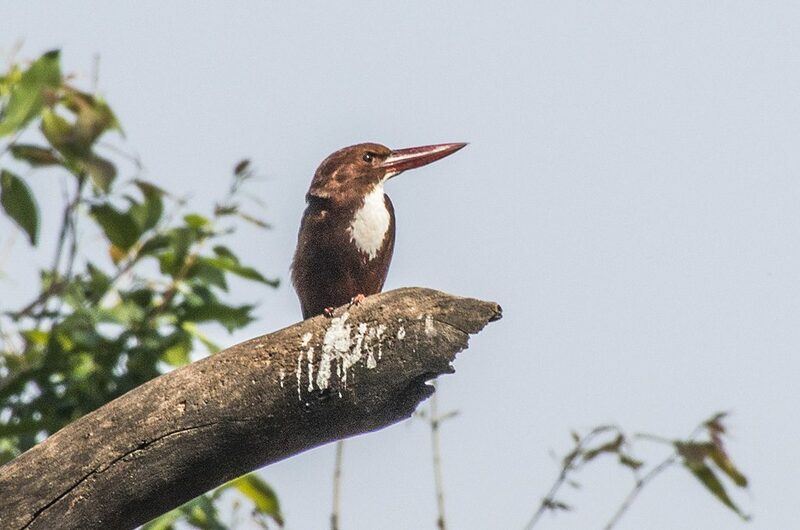 India is a bird watchers paradise. There were birds everywhere we travelled. They never ceased to impress us with how colourful or interesting they were and we enthusiastically took their photos whenever we were able. Written by Keith Davey. Photos taken by Keith and Pat Davey.